Reason for Reading: Read more from this author. June was a strange reading month for me. I bought books, but I was so off with my reading that it was a struggle to read them. I heard such good things about this book, so I thought it was a perfect way to rekindle my reading. The first time I started it, I barely got into it and had to put it aside. Then, I decided to read it with Ana from things mean a lot, so I had to try again. I managed to finish it and I really enjoyed it... But, I didn't love it. For this review, I am going to answer 6 questions. Three of the questions I came up with and the other three Ana came up with. You can read her answers to the same questions on her blog. 1. 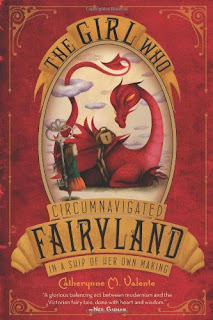 One of my favourite things about The Girl Who Circumnavigated Fairyland in a Ship of Her Own Making was Valente's very conscious use of a Edwardian/Golden Age of children's literature narrative voice. What did you think of the narrator and of the book's classic feel? What do you think it adds to the story? I was excited about this until actually faced with reading the book. I think one of the main reasons that I didn't love this book is because I didn't like how it was written. I think if I could have wrapped myself up in her words, I would have loved the book a lot better. It had a lot to do with the timing, but this writing style has never really appealed to me. I am not even entirely sure why that is, but I have a hard time dealing with it. It's not something I can specifically put my finger on other than to say, I don't generally enjoy it. 2. What did you think of September herself? What was your favourite thing about her? I enjoyed September. I wasn't sure if I was going to because I have a hard time with children main characters in books. She wasn't that bad, though. There were a few times she bothered me, but generally she was well written and enjoyable to follow around on her adventures. I really enjoyed her curiousity and how she really lived her experience while in Fairyland. She was a brave little girl and a fun heroine. It made the book enjoyable because it was an adventure story. "I wrote a book about a girl who never said no. When she first enters Fairyland, it isn’t because she falls through a hole in the earth or wanders through a closet or chases a rabbit. It’s a choice, and however dark her journey becomes, she never wishes to take it back. The Green Wind shows up at her door riding a flying leopard and asks if she wants to go. If she wants more than she’s been given. If she wants to leave this world and grasp for another, a mad and gorgeous place, sight unseen, results uncertain. This sort of draws on what I said before. I really enjoyed September for her curiousity and for being able to carry on even when things get a bit tough going. I also enjoyed that this was a choice. She decided to have these adventures. It was not something she had to do and she was told the difficulties that may present themselves, but at the same time she is not entirely sure what she is headed for. She decides to go and make the best of it. I agree, what Valente says really sums up the book for me, too. 1. September met a lot of characters along her journey. Which was your favourite? Why? This is a hard question! There were a lot of secondary characters and they all added to the story in just the right way. From the very beginning there is the Green Wind who carries her off on her adventures. Even the 'evil Marquess' is an interesting character once we learn her back story. She was just a presence in Fairyland until near the end and then everything fell into place. Actually it might be her. I wouldn't mind seeing more from her if there really are more books in this series. 2. What did you think of September's thoughts on the war being fought at home? She believes her father has abandoned her and her mother is often not at home. Do you think this reflects how many children felt during the World Wars? I actually rather like my question because it is not something I have ever thought about before. I suppose I knew that it was hard for children during the Wars because their parents were gone, but they likely were too young to entirely appreciate what was happening. September feels like she has been abandoned by her father, when really he is just off fighting the war. And, this was the changing time for women to be prevalent in the work force. It is possible that before now September always had her mother home with her. It would be a huge change for her, and really for all children that experienced the wars. I suppose it would depend on their ages. Some of the children older than her might understand a bit better, but those younger might think even worse things of their parents. It was a difficult time. 3. What did you think of this book overall? Did it compete well with other Valente books that you have read? Let us face facts here. I like the idea of Valente's books, but I am a huge fan of how she writes. It just doesn't flow for me and it was no exception with this book. I can't get lost in her writing and it makes me sad because I want to. I finish these books and think I should love them, but I am always held back from that. This was no exception. This book had a delightful premise, was executed very well, and had many elements that I love in fantasy and fairy tales. I have had similar problems with her adult novels. I love everything about them, but I don't love the books in the end. I say it is the writing, but it could be something that I am entirely overlooking. I just know that everything says I should love these books by her and I don't, but yet I enjoy them enough to keep reading her. Once again, don't forget to visit Ana's blog to see her response to this book! This does sound interesting, but I'm not sure I'd like the writing style. I am intrigued, though, and the title grabs me for some reason. I wasn't a fan of this one either, but my daughter who is 1 loved it. I read her post on The Big Idea on Scalzi's blog and it really put this higher up on my radar, but I have reservations because of my previous experience with her writing. I've read one of her short stories which I really enjoyed, but her book A Guide to Folk Tales in Fragile Dialects was a bit of an enigma. Beautiful writing but way over my head for most of it. She is someone that I want to enjoy as well. I guess I should really read In the Night Garden to see if I can make a connection with it. **Anna: This is hard for me... On the one hand I enjoy her ideas, but on the other hand I have issues with her writing style.. Hard for me to say if I recommend or not. I'm curious to see how I will feel about this one after I read it. It sounds interesting so I'm sure that I'll read it at some point. I SO want to read this! I'm at the point where i want to read anything/everything Valente writes. Ok sure, In The Night garden wasn't my favorite, but it was still pretty damn good. **redhead: Her books are pretty damn good. I will continue to read from her.